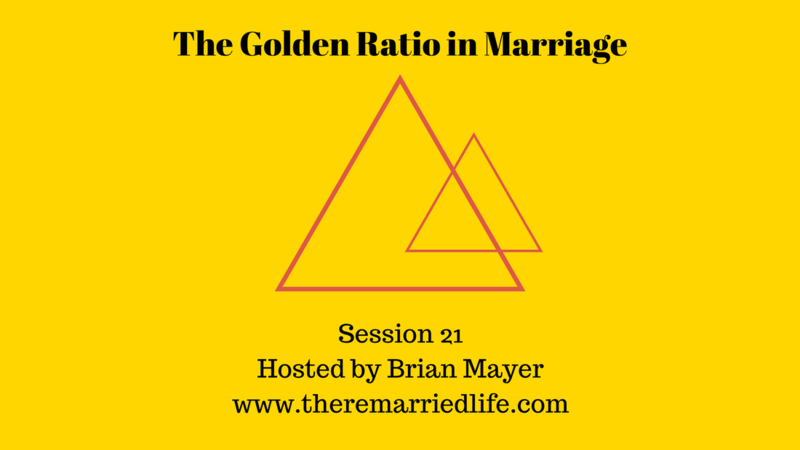 Today’s episode is all the Golden Ratio in Marriage. Before I get into that, though I want to talk a little about the Golden Ratio when it comes to math. Not sure who decided this, but the Golden Ratio in a line occurs when you divide the line into two pieces such that the longest piece divided by the shortest piece is the same ratio as the longest piece divided by the entire line. There are Golden Ratios in all walks of life. In Major League baseball, hitting .400 which means 4 hits for every 10 times to bat is considered the Holy Grail. In the Senate, in order to filibuster proof a bill, there needs to be 60% support. In food, the recipes need the right balance of ingredients in order to make a tasty dish. I remember a friend who made lemon bars in a Home Economics class, by putting a cup of salt rather than a cup of sugar in the mix. Needless to say that was the worst lemon bar I had ever tasted. There is also a Golden Ratio in Marriage and Relationships. This involves the number of positive things that you do versus the negative things you do to and toward your partner. John Gottman who has studied couples for more than forty years and is well known for his ability to predict divorce by watching just small portions of a couples interactions, states that there must be at least 5 positive interactions for every 1 negative to be happy and healthy. Gottman states that more than 5 is helpful. If a couple is at 2 or 3 to 1 then they are operating as roommates. If the ratio is 1:1 then the couple is heading for divorce. Why the need for some many more positive interactions? Let’s talk brain science. Elizabeth Kensinger who is a university professor wrote a fantastic article that is linked below in the Resources sections. She quoted research that showed when people are asked to recall details from negative versus positive events, that more details can be recalled when the event is negative. She also discusses how negative events seemed to be more well preserved over a lifetime in our brains. So this is why positive interactions with your partner are critical! What types of positive interactions can be counted? Really anything can be large or small. It doesn’t always have to be a diamond ring or a trip to Europe. It can be something as simple as an encouraging text for an upcoming stressful meeting, buying a bag of your partner’s favorite candy, doing the laundry if that is typically not your chore. You might come home an hour early one day and spend it with your partner. When you pass each other in the hallway at home reach for a hug and a kiss. The goal is to pile up the positive interactions so that the love tanks gets filled. The more positive in the tank the less impact that a negative has. If you are at a loss for what to do I would encourage you to pick up a copy of a book called The Love Dare which talks about taking a 40 day challenge to practice unconditional love. Additional, a book called The Respect Dare is more specifically geared toward women and helping them actively create a deeper connection with husband. We are a participant in the Amazon Services LLC Associates Program, an affiliate advertising program designed to provide a means for us to earn fees by linking to Amazon.com and affiliated sites. This means that The Remarried Life Podcast receives a percentage of the sale. Your cost does not change. By purchasing these items you are helping cover the cost of expenses to produce this podcast. Thanks in advance for your continued support of the podcast!